So what puts the "S" in the Apple iPhone 4S? 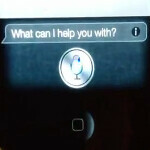 How about Siri, Apple's voice activated "personal assistant"? Sure, there is the A5 dual core chip and the 8MP camera with 1080p video capture, the notifications screen, stock ticker and a few other features that are all new on the latest iteration of Apple's touchscreen handset. But the one thing that everyone seems fixated on when discussing the Apple iPhone 4S is Siri. What that in mind, it shouldn't be terribly surprising that Apple choose Siri to focus on in one of the handset's first television commercials. From how to fix a flat tire or how to tie a bow tie, Siri has an answer. Even when a child asks, "What does a weasel look like? ", Siri comes up with a quick response. The ad also shows how useful the feature is when locked out of your house as it comes back with the names and numbers of local locksmiths. And of course, as the ad shows, you can ask Siri for a wake-up call. One thing remains the same. At the end of the ad, we are told that this is the "most amazing iPhone yet". Will the next ad feature an iPhone being unlocked by a thief using Siri? User: "I'm locked out" Siri: "I will unlock your iPhone for you"
or show the islave getting bored of it after 2 hours???!!! Or the android user pointing and laughing saying we had that last year......i told you so!! They own it, do they not? You use a phone you bought, but did not create, correct? Just sayin'. Many companies buy patents or technology from other companies and advertise it as their own, which is totally acceptable. I don't see any difference in this case, do you?